The City of Mount Pleasant offers property tax abatement for qualifying projects. Mount Pleasant offers 5-year property tax abatement for industrial projects not receiving TIF assistance. Abatement reduces property tax by 75% in Year 1; 60% in Year 2; 45% in Year 3; 30% in Year 4; and 15% in Year 5. The Mount Pleasant Area Development Commission will navigate the government process to ensure that your request is handled in a positive and timely manner. If a construction project, either new construction or improvements to existing properties, adds value to a property, it is most likely eligible to receive a break on increased property taxes resulting from the improvements. Improvements to commercial properties may be eligible to receive either a 3-year, 100% tax abatement, or a 10-year, graduated abatement. Projects that involve three or more dwelling units may be eligible to receive a tax abatement on 100% of the values added for 10 years. Improvements to single or two family residential dwellings may be eligible to receive a 5-year tax abatement for up to $75,000 in improvements. Access Energy Cooperative plays an active role in the development of rural Iowa. To reflect its commitment, Access Energy Cooperative created the Access Energy Cooperative Revolving Loan Fund (RLF) to improve the quality of life in rural southeast Iowa by contributing to long-term improvements in the local economy. The RLF is a local funding source with a goal of providing low interest loans to assist with local economic and community development projects. The Henry County Revolving Loan Fund provides gap financing to business start-up and retention in Henry County, Iowa. Applicants can receive up to $50,000 in funds to either start or continue an existing business in Henry County. The applicant is required to fill out an application and submit it to Southeast Iowa Regional Planning Commission and also be involved with a sponsoring lender. These funds are used to provide gap financing for a project after the primary lender has reach its lending limit. The Henry County RLF has a board that studies each application and makes a recommendation for approval to the Henry County Board of Supervisors. The emphasis for each project is on job creation and retention. There is also a SEIRPC Regional Revolving Loan fund. The difference with this pool is that anyone in the four county SEIRPC region can apply and the lending ceiling is much larger than that for Henry County, which is capped at $50,000. The Industrial New Jobs Training Program is financed through bonds sold by Iowa’s 15 community colleges, including Southeast Community College locally. Participating businesses divert a percentage of Iowa state withholding taxes generated through new job creation to retire the bonds. As such, training essentially is at no cost to the business. The Industrial New Jobs Training Program provides businesses, which are expanding their Iowa workforce, with new employee training. The City of Mount Pleasant may provide a property tax rebate or business assistance grant via Tax Increment Financing. Estimated value of rebate is $31 per $1,000 of taxable valuation. Business assistance grant is based on jobs created, average wages, and capital investment. 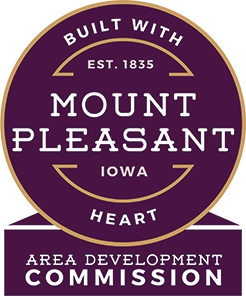 The Mount Pleasant Area Development Commission prides ourselves on personal service. You’ll find that it is easy to do business in Mount Pleasant and Henry County. We will work with you along the way to ensure a timely and efficient project completion. The High-Quality Jobs (HQJ) program provides qualifying businesses assistance to off-set some of the costs incurred to locate, expand or modernize an Iowa facility. This flexible program includes loans, forgivable loans, tax credits, exemptions and/or refunds. The Iowa Economic Development Authority (IEDA) offers this program to promote growth in businesses, which employ Iowans in jobs defined as high-quality by state statute. Eligibility Requirement: A business located in an economically distressed area must pay at least 100% wage threshold throughout the applicable contract period. The City of Mount Pleasant exists within a “distressed county” and must adhere to the 100% wage threshold requirement. Wage threshold in the Mount Pleasant labor shed area is currently $16.56 per hour. The Economic Development Set Aside (EDSA) program provides financial assistance to businesses and industries requiring assistance to create or retain job opportunities in Iowa. EDSA develops viable communities that provide economic opportunities for people, especially those with low and moderate incomes. This one-time, corporate income tax credit is available to participants in the New Jobs Training (260E) Program. Iowa offers this credit as an incentive for businesses that provide additional training to employees and those that expand their workforce. Iowa offers the first in the nation Renewable Chemicals Production Tax Credit. The program incentivizes the production of 30 high-value chemicals derived from biomass feedstocks. According to the U.S. Department of Agriculture, the credit represents the “strongest” incentive package for the bio-based chemical industry. Iowa sets itself apart as being one of the few states to offer a refundable research activities credit. Iowa companies earn refundable tax credits for research and development investments that may be paid directly in cash to the company once its tax liabilities have been met. A company must meet the qualifications of the federal research credit in order to be eligible. Supplemental research credits are also available through the High-Quality Jobs (HQJ) program.